It’s time to pull out those party looks! The holidays are such a popular time for social gatherings with friends, family and co-workers, which means there are so many different events on our calendar. Keeping our festive ensembles in order so we can enjoy stress-free dressing is of the utmost importance. From cocktail parties to holiday socials at the office, it’s the most wonderful time of the year to get dressed. Though we love making statements with our fashion on any given day, holidays are the best time to whip out our sequins, metallics, faux fur and seasonal colors. Check out all of the best items we are sprinkling into our wardrobes to complete all of our festive outfits this year. Who’s ready to Shop With Us for the most showstopping party looks? The best part of our roundup is that all of these picks can be worn well after the parties end. Sorry fashionistas! No “Ugly Christmas Sweater” contests will be won with this Topshop Christmas Party Popper Sweater because it’s way too chic. The sweater features a whimsical sequin design in various colors laid against a black and tinsel background. Instead, just settle for being the best dressed and pair this sweater with a pleated midiskirt and sock boots. Since the top is just as cozy as it is dressy, we can get lots of winter wear out of it even when there isn’t a social gathering in our plans. Sizes range from 2 to 10 and run small so it is best to eye the size guide carefully to score the most comfortable fit. See it: Snag the Topshop Christmas Party Popper Sweater for $100 while all sizes are still in stock. Not your thing? Check out other sweaters from Topshop. Party time is sparkle time whenever we hit the town in this sequin pencil skirt. We love that this design has the larger sequins which sets it apart from other shimmery skirts. The Halogen Paillette Pencil Skirt comes in two hues which are black and purple taupe. We’ll gladly mix and match for the parties on our calendar this year. The Halogen skirt can be paired with a sweatshirt and sock booties for a super cool street style look that blends athleisure and edgy going out wear. For a much tamer look, we can wear it with a simple turtleneck tucked in at the front. This skirt comes in regular and petite sizes. Regular sizes range from extra small to extra large. Only select petite sizes are available which are XXS, extra small and small. See it: Grab the Halogen Paillette Pencil Skirt for $99 while both color options are still in stock. 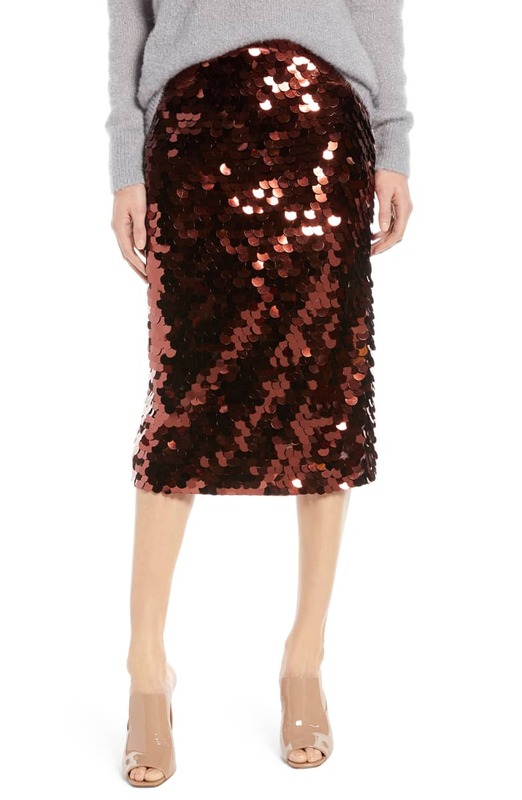 Check out more sequin skirts available at Nordstrom! 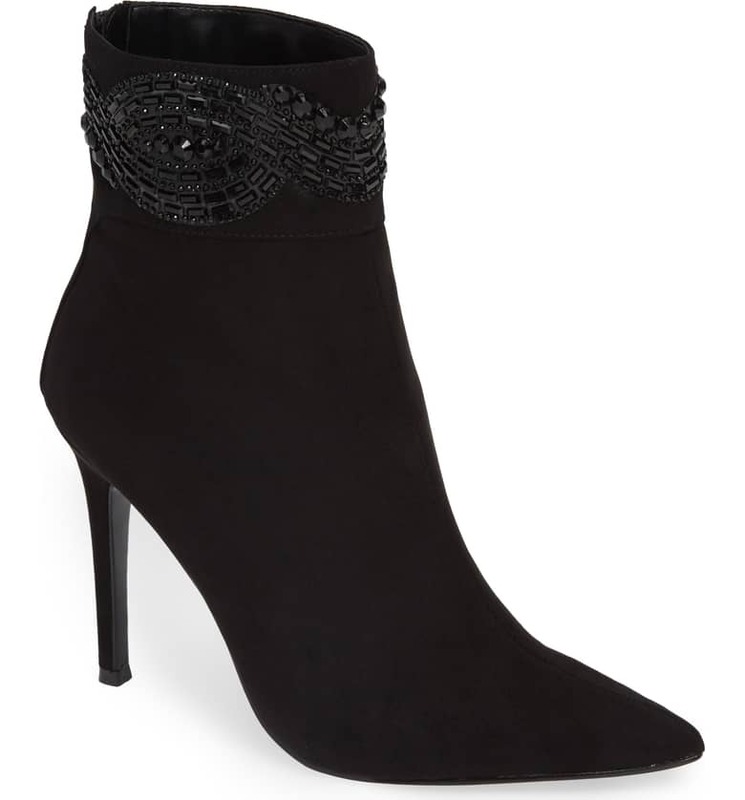 This Nina Derika Bootie is the perfect beaded riff on the classic black suede ankle bootie. Anyone who loves to keep a minimal personal style even at the fanciest shindigs can step out in a look that shows off these boots. We will be tucking our most curve-hugging skinny pants into this pointed-toe design and stepping out in a long sleeve blouse topped by a cropped faux fur jacket. A pleated A-line midiskirt is also a great way to make sure these beaded booties are the star of the show. Sizes for this bootie range from 5 to 11. See it: Get the Nina Derika Bootie for $129 while so many sizes are still in stock. Looking for more festive ankle bootie options? Check out more from Nina at Nordstrom! Who says party looks can’t be comfortable? We’re in for a good time and a great fit with these Us reader favorite Kut from the Kloth Diana Stretch Corduroy Skinny Pants. The burgundy color screams “holiday party” and can easily be paired with a sparkly sweater or frilly blouse and heels. Still, these trousers come in 10 color options including merlot and navy. These corduroy skinny pants come in regular and petite sizes. Both regular and petite sizes range from 00 to 18. See it: Snag the Kut from the Kloth Diana Stretch Corduroy Skinny Pants (marked down 25 percent off their original $70 price, now $50) while so many colors and sizes are in stock. Want more options? 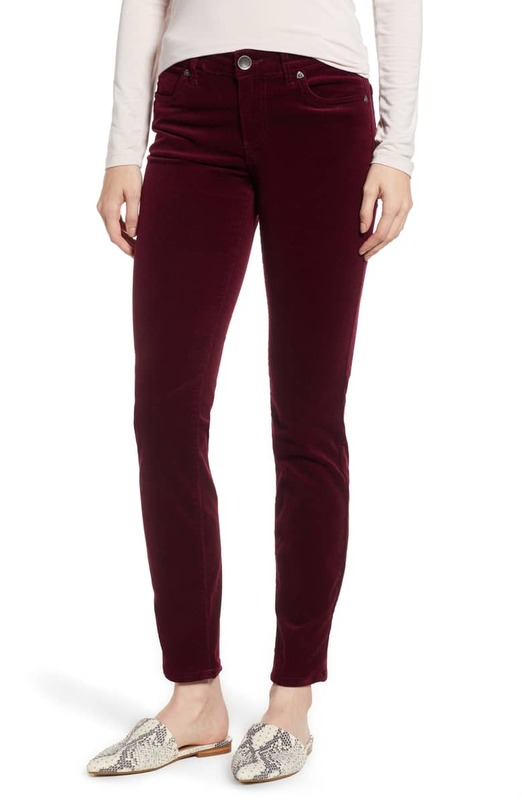 Check out more corduroy pants at Nordstrom! Forget all the holiday style rules about the green and red color combo, sequins and velvet. This elegant wrap dress gives off the ultimate holiday vibes with its gold metallic fabric, sultry V-neck and a bow at the waist. Select sizes are available ranging from 10 to 16. All we need to pull off this sparkly frock is a bold red lip, a pair of our favorite black Christian Louboutin heels, a classy clutch and the perfect minimal jewelry pieces. See it: Get the Eliza J Backless Metallic Maxi Wrap Dress for $168 while it is available in select sizes. Prefer a different style? Check out more holiday dress ideas at Nordstrom!